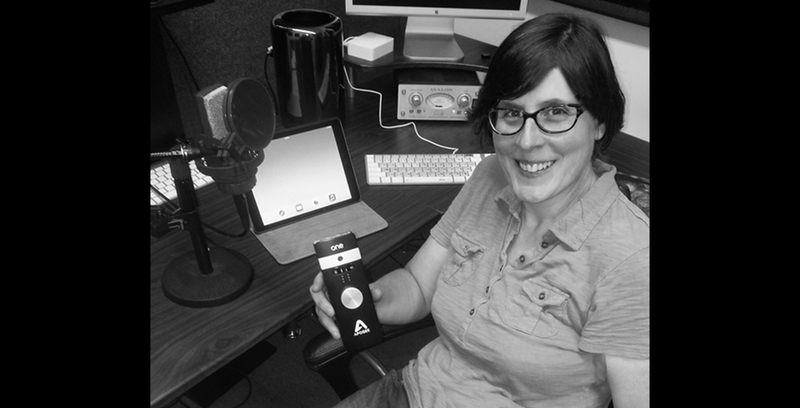 Our next Customer Spotlight feature highlights the story of Patti Ford, a proud Apogee ONE for iPad & Mac user and voice over actor for over 25 years. Patti’s passion for voice over began as an eight-year-old, when she would read magazine ads aloud in the bathroom. She loved how her voice echoed off the walls. Since then, Patti has taken her voice from the bathroom to her own top-notch studio and beyond. Her national portfolio of clients includes Bose, Rinnai, PBS, Conoco Phillips, MetLife, New York Life, United Way, American Heart Association, and Comcast. Based North of Boston but often traveling, Patti delivers high-quality voice overs for commercials, narrations, IVR & phone messaging and documentaries. Apogee: In your career, what has been the most fun and rewarding voiceover genre to work in? Patti: I love radio commercials. I like taking a concept and making it come to life through sound. It’s a challenge too because when you’re doing voice over for radio, it has to be bigger than a television read because there’s no image to support the read. So you need to have presence and sound natural. Occasionally, when I work with a client who would like to read his/her radio commercial, I try to get them to understand that because the listener can’t see their facial expression. It’s very much like theatre. Be bigger, but sound natural. A: What’s your setup like and how are you using your Apogee ONE for iPad & Mac? P: Many of my colleagues have home studios, but I would never get anything done if it were in my house, so I have an office studio. I work on a Mac Pro with Pro Tools and I have the Adobe Creative Cloud, so I can edit audio & video when necessary. My mic collection is pretty diverse: Neumann TLM 103, Mojave MA20, AKG C414 and a Shure SM7. My Apogee ONE is used specifically for travel and when I’m at my cabin in Western Massachusetts. A: Who have been you your greatest influences & or motivators? P: The one person who stands out in my mind is Nancy Wolfson, my voice over coach. She has taught me so much about the industry and how to dissect copy. She’s a great teacher and I’m grateful for what I’ve learned. A: How has your Apogee ONE for iPad & Mac changed or improved the way you record? P: When traveling, I need my laptop, audio interface, mic and sound absorption. This equipment is bulky and it made traveling more stressful. Last May, I attended a wedding in Arizona and I chose to leave it all behind because I had a lot of things to bring with me. Well, I lost quite a bit of money that week because I didn’t have my set up. A voice over talent needs to be available because work comes quickly. I decided to research equipment that’s better suited for travel. I decided on the Apogee One because of its size and quality. I love it. I plug it into my Ipad and I plug my Mic into the Apogee ONE. The quality is impressive and it’s so easy to use. I use it at my cabin too. I have no internet or cell phone service there, but I can receive email messages if I stand in this one area of my property, so when I get a message to record, I set up my Apogee One, record and then drive in town to a local café that has free Wi-Fi and I send it out. It’s an awesome product that gives me peace of mind when I’m not near my studio. I have to travel to Chicago in November and I feel so much better knowing that I don’t have to lug all the bulky equipment with me.